The Nigerian army has remained silent on the whereabouts of the controversial leader of the Indigenous People of Biara, Nnamdi Kanu. The Nigerian Army said on Friday revealed that it has successfully curtailed the activities of the Indigenous Peoples of Biafra (IPOB) in the South East, while clashes between farmers and herdsmen in the region had been prevented by troops in the past two weeks. 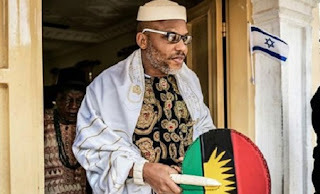 However, the army was silent on the whereabouts of IPOB leader, Nnamdi Kanu, who was said to be on the run after troops laid siege on his compound in Aba, Abia state. According to The Nation, providing an update on Exercise Egwu Eke II (Python Dance II) the army said activities of kidnappers and other criminals have also been checkmated while several people have been arrested and handed over to the police for prosecution. A statement signed by the Deputy Director of Public Relations, Nigerian Army, Col. Sagir Musa, reassured the public that the army was ready to maintain peace and order in the entire South East. The statement reads: “Following the commencement of Exercise EGWU EKE II on Friday, 15th September 2017 in 82 Division Area of Responsibility, simultaneous activities have started in Abia, Anambra, Ebonyi, Enugu, Imo and Cross River States without hitch. “The essence of the exercise is to enhance troops’ preparedness and proficiency in dealing with emerging security challenges peculiar to the South-East region, such as kidnappings, armed robbery, communal crisis, farmers- herdsmen clashes, cultism, violent agitations and insurgency, amongst others. “One interesting aspect of the exercise is that, it is multi agency in nature and execution, thus enhancing synergy of efforts among the Services, security and response agencies. Relevant para-military organizations such as the Nigerian Police Force, Nigerian Security and Civil Defence Corp (NSCDC), Department of State Security Service (DSS), Federal Road Safety Commission (FRSC), National Drugs Law Enforcement Agency (NDLEA) and Nigerian Immigration Service (NIS) are all synergizing and collaborating in the exercise to ensure attainment of these objectives. Similarly, there are elaborate humanitarian activities associated with it, hence, the 82 Division Nigerian Army embarked on free medical services. “The first was on Tuesday, 18th September 2017 at the Adult Education Mass Literacy Centre, Nkwuagu Primary School Amaagu, Abakaliki Local Government Area of Ebonyi State. The Chief of Army Staff, Lt. Gen. T.Y. Buratai, accompanied by the Deputy Governor of Ebonyi State, Dr. Eric Kelechi Igwe, the General Officer Commanding, 82 Division Nigerian Army, Major Gen. Adamu Baba Abubakar and the Chief of Training and Operations, Army Headquarters, Major Gen. David Ahmadu and other senior Army Officers, were personally present at the commencement of the free medical outreach. “The turnout was impressive, as over 2,000 people benefited in the areas of dental, optometry, laboratory services and blood pressure measurements. Others were dispensing of eye glasses, de-worming tablets, assorted drugs, mosquito nets and sanitizer to various categories of people. In the same vein, similar medical outreach will be conducted at Nnarambia community Central Primary School, Ahiara Mbaise in Ahiazu Mbaise LGA of Imo State on 23rd September 2017 as part of the activities of Exercise EGWU EKE II. “The Division has also scheduled similar free medical outreaches in other states covering its area of responsibility during the exercise. Furthermore, in addition to visiting the Operational Headquarters of Sector 5 of Exercise EGWU EKE II, at 24 Support Engineering Regiment, Abakaliki, the Chief of Army Staff also visited the Step-Up Headquarters of 82 Division at the Nigerian Army Language Institute, Ovim, in Isiuokwuato LGA of Abia State.